GROW Centers are springing up this Spring! Join us as we provide materials giveaways, sales, and greening experts to answer all your questions! E-CYCLING DROP-OFF added to GROW Center Pop Ups: April 13, April 27, and May 4! Residents can dispose of old electronics! Bring your old computers, laptops, cell phones, and chargers to recycle. Please note that white goods, such as microwaves and refrigerators, should be disposed of at a DPW convenience center. For a complete list of electronics accepted:https://publicworks.baltimorecity.gov/recycling-services. 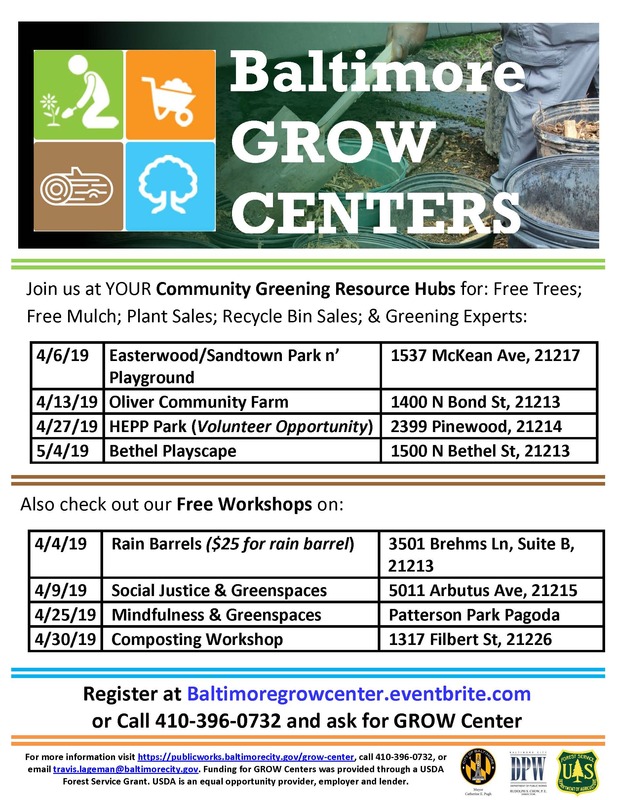 To register, please visit Baltimoregrowcenter.eventbrite.com, or call (410) 396-0732. * No restroom facilities. Please plan ahead.